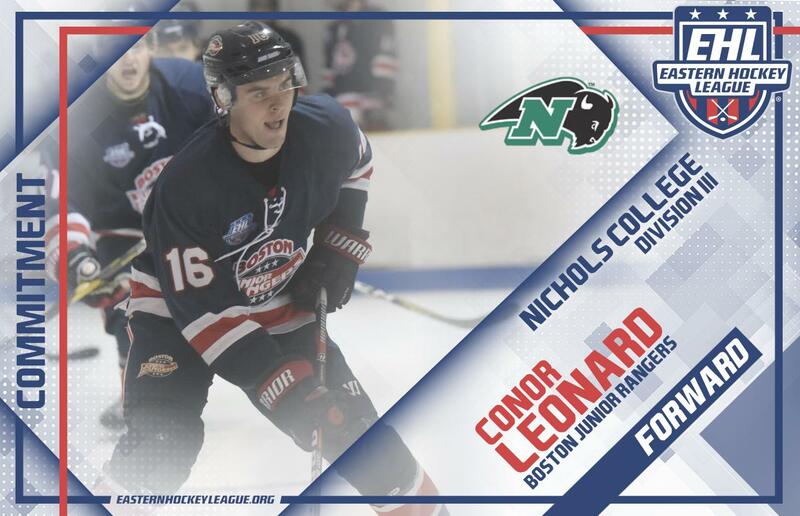 TEWKSBURY, MA -- The Boston Jr. Rangers are pleased to announce that Conor Leonard has committed to Nichols College for the fall of 2019. Leonard unfortunately saw his 2018-19 season end due to injury a few weeks ago, but prior to that, the '98 forward had tallied 24 points in 29 total games. "We are very happy for Conor on his commitment to Nichols,” said EHL head coach and general manager Rich DeCaprio, “Conor is a great kid, and very good hockey player. He had a tough go this season with some untimely injuries, but he persevered and when he was healthy, he contributed a lot to the team's success. He will have a great 4 years at Nichols." As DeCaprio mentioned, Leonard's season-ending injury wasn't his only one this year, but the native Billerica, MA continued to work towards this commitment. Overall, this decision has been a long time coming for Leonard, who closes out his junior hockey career having tallied 66 points in 108 total games in the Eastern Hockey League (EHL). Ultimately Leonard's choice to join the Rangers in his final year was what led him to Nichols, and for that, the skilled forward is very appreciative. "Playing for the Rangers has been a great experience for me," said Leonard. "The coaching staff has developed me both as a player and as a person. Playing college hockey has always been a dream of mine. With the help of Coach DeCaprio, Coach Aucoin, my teammates and my family, I have achieved that. I am excited to be joining Nichols College and look forward to my future with them." While Leonard won't be in the lineup this weekend, he will surely be in the building cheering on his teammates. The EHL team is set to face-off with the Seahawks Hockey Club this upcoming Saturday, Sunday, and Monday in the First Round of the playoffs.